Director John Krasinski’s gripping thriller is now available to own on DVD, Blu-ray, and 4K Ultra HD and digital copy. When a creature hunts by sounds, man must learn to be quiet. 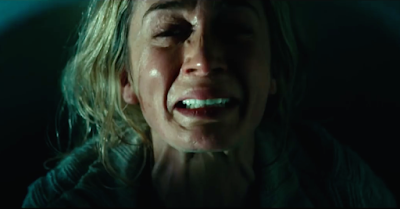 A quiet place follows a husband and wife trying to protect their children from certain death. The film, which earned a 95% fresh score on Rotten Tomatoes, is unlike any other horror/thriller you’ve seen. With little dialogue, it’s no wonder this was described as “mind-blowingly tense (Isaac Feldberg, The Boston Globe). Lee (John Krasinski) and Evelyn (Emily) Blunt live in a modest farmhouse with their children. Like any parents they want the best for their children and they would do anything to keep them safe. Lee and Evelyn are consumed with sound. They have taught their children to avoid sounds. They walk barefoot, on sand and on predetermined paths. There are deadly creatures nearby that hunt by sound. It’s clear that even the slightest noise will bring these fierce monsters straight to their door. One of their daughter’s is deaf, and the whole family signs. That’s probably one of the reasons they have survived because even a whisper could get them killed. Playing monopoly requires handmade crocheted pieces that won’t make noise when they touch the board. The family has adapted fairly well to their new reality but mom Evelyn is expecting a baby soon. They are working to prepare to keep a newborn baby’s cries hidden from the oversensitive creatures lurking nearby. This film leaves leaves many questions unanswered. Who are these creatures? Where did they come from? Writer/Director John Krasinski likely had a well thought out back story for them, but he does not share with the audience. The mystery surrounding these monsters only heightens the tension. The film begins on day 89. I find it refreshing that you don’t know more and it isn’t over explained. On day 89, Evelyn is not pregnant and the family has just been to a drug store. They obviously forgot to pick up the essentials, like birth control. Family planning should be the number one issue for all families in the new, quiet world. Did they plan this child? I know that John Krasinkski wanted to leave a lot unexplained but I would really like him to tell me if this family planned another child. Bad idea guys. Even though you’re going to attempt to sound proof your home, it’s just a bad idea. The creatures have definitely killed off a lot of the population. Dogs and cats running arounds making noise probably went quickly too. What’s left, makes for an interesting “listen”. Sitting in the theater, I couldn’t help but notice how loud popcorn is when people near you chew it. I would have been neat if they had offered a popcorn and candy wrapper free showing. A quiet showing of A Quiet Place. The acting in this film is excellent. The film is truly about one family and you have to care about the survival of that family. Obviously, as real life husband and wife, Blunt and Krasinski have the chemistry to pull off their roles. Besides having a clear connection they both have nailed the look of parents who have lost a great deal and would do anything to keep their children safe. For this movie to work you really had to become invested in the family, and their well-being and that certainly happens due to excellent performances. ILM handled the creature effects so they blend seamlessly with the live action. You’d never know that they didn’t actually exist in the scenes and that the actors weren’t really afraid of them. A Quiet Place looks very good on both Blu-ray and 4K UHD. The 2160p presentation is a modest improvement over the Blu-ray, which is a solid 4 out of 5. The film has a raw, grainy feel to it. When you compare the Blu-ray and 4K in the drug store and as the family walks through town there is a noticeable difference in clarity in fine detail. The colors of the trees and the corn fields are richer and the outdoors come alive a bit more in ultra-high definition. Black levels are stable and the nuanced performances are visible in the lowest light in a basement, or at night in a grain silo. You’ll notice a slight difference between the red light bulbs when you compare formats but again, nothing drastic. 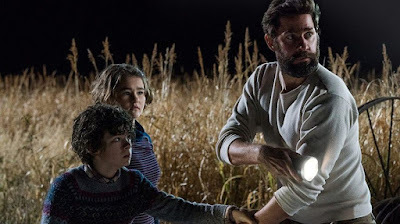 With very little dialogue, A Quiet Place still has a lot to listen to. You’ll be listening to footsteps and even the noise of a marker on a calendar. The Dolby Atmos soundtrack delivers dialogue that is whispered and very rarely spoken. It offers a shrill creature that travels from one end of your living room to the other as it chases the poor family around their farm. As the wind blows through and the leaves rustle on screen you will want your home to be silent too. Water lovers will enjoy Lee’s trip to the rushing river with his son as he teaches him that a waterfall is the one place they can speak freely without fear. This film makes very good use of the silence and you won’t want to watch it next to an old noisy wall unit air conditioner. Plan ahead so you can really take in the silence. Creating the Quiet – Behind the scenes of A Quiet Place (14:46) – A look at the unconventional thriller with only 2-3 minutes of dialogue. Director John Krasinski explains how project went from horror to thriller and how he and his wife came on board. 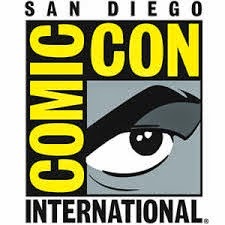 Cast and crew interviews are included. The Sound of Darkness – Editing Sound for A Quiet Place (11:44) – This features focuses on the all-important sound design, and the need for the crew to be quiet while filming. The team explains that silence is not easier and they explore the challenges this film presented. A Reason for Silence – The Visual Effects of A Quiet Place (7:34) – A discussion of the designs for the creatures and working with ILM to create John Krasinski’s vision for the monster. 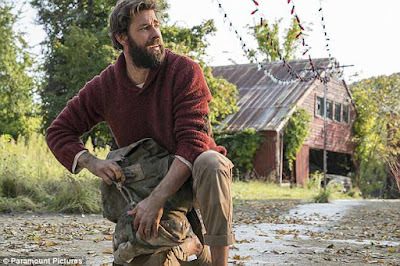 A Quiet Place is unlike any thriller or horror film I have ever seen. It doesn’t have the re-watchability factor of my typical monster movies. It’s a heavy film and its not one you want to go through every week. It follows a really great family with really bad things happening to them. It does have the kind of re-watchability that you’ll hear and notice new things each time you do. Director John Krasinksi should be extremely proud of his directing and acting in this film. I can’t believe that the same silly guy from the office could be that dramatic and yet he is. For those who aren’t into horror, the bloody parts aren’t that much or that often. If you can’t take the tension of horror movies, this isn’t for you because the movie will have you wound up tight for sure! Recommended.